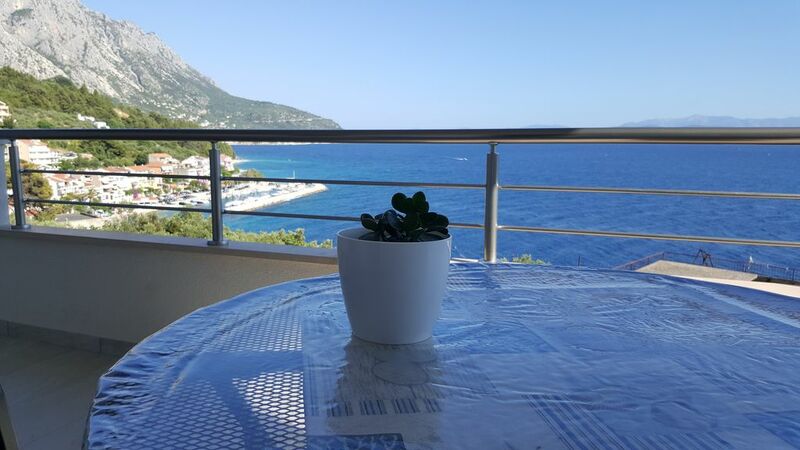 Apartment is situated in a house on a small hill with a beautiful view and 70m from the beach. Small shop is also 70m from the apartment in the same direction as the beach. Center of Podgora with coffee bars and restaurants is 10-15 min of pleasant stroll by the beach. Apartment has WiFi included in the price of your stay and parking place for your car. Bedroom, kitchen, bathroom, toilet, terrace and barbecue if asked. We are available for any assistance or information you may need while staying with us. If you want to try our home made olive oil or home made beverages - orahovica (walnut liquor) or višnjevac - (cherry liquor) you are very welcome. :-) We also have small barbecue so if you want to have yourself a nice barbecue just ask and we will show you around. Beach is 70m from the house, down from a hill. Climb is little bit steep but it is not a long walk. Small shop is also 70m in the same direction. One restaurant is 150m from the house. When you go down to the beach just go to the left and have a pleasant walk, you will arrive to the restaurant in less then a minute. Second one is about 300m in the same direction as the first one. Some 5 min of slow walk by the beach. Next to this restaurant is the ATM machine. Other ATM machines are in town center: - Societe Generale - Splitska banka, Intesa Sanpaolo - Privredna banka Zagreb, UniCredit - Zagrebačka banka Many other restaurants and bars and mini markets are in the Podgora center, 10-15 min walk in the direction to Makarska.